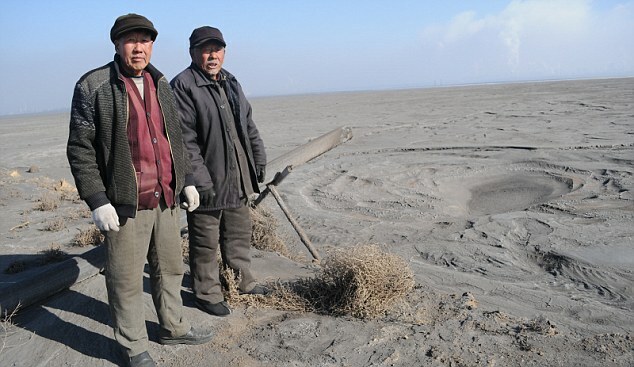 Rusting pipelines meander for miles from factories processing rare earths in Baotou out to the man-made lake where, mixed with water, the foul-smelling radioactive waste from this industrial process is pumped day after day. No signposts and no paved roads lead here, and as we approach security guards shoo us away and tail us. When we finally break through the cordon and climb sand dunes to reach its brim, an apocalyptic sight greets us: a giant, secret toxic dump, made bigger by every wind turbine we build. Retired farmer Su Bairen, 69, who led us to the lake, says it was initially a novelty – a multi-coloured pond set in farmland as early rare earth factories run by the state-owned Baogang group of companies began work in the Sixties. As more factories sprang up, the banks grew higher, the lake grew larger and the stench and fumes grew more overwhelming. People too began to suffer. Dalahai villagers say their teeth began to fall out, their hair turned white at unusually young ages, and they suffered from severe skin and respiratory diseases. Children were born with soft bones and cancer rates rocketed. Official studies carried out five years ago in Dalahai village confirmed there were unusually high rates of cancer along with high rates of osteoporosis and skin and respiratory diseases. The lake’s radiation levels are ten times higher than in the surrounding countryside, the studies found. Since then, maybe because of pressure from the companies operating around the lake, which pump out waste 24 hours a day, the results of ongoing radiation and toxicity tests carried out on the lake have been kept secret and officials have refused to publicly acknowledge health risks to nearby villages. There are 17 ‘rare earth metals’ – the name doesn’t mean they are necessarily in short supply; it refers to the fact that the metals occur in scattered deposits of minerals, rather than concentrated ores. Rare earth metals usually occur together, and, once mined, have to be separated. Neodymium is commonly used as part of a Neodymium-Iron-Boron alloy (Nd2Fe14B) which, thanks to its tetragonal crystal structure, is used to make the most powerful magnets in the world. Electric motors and generators rely on the basic principles of electromagnetism, and the stronger the magnets they use, the more efficient they can be. It’s been used in small quantities in common technologies for quite a long time – hi-fi speakers, hard drives and lasers, for example. But only with the rise of alternative energy solutions has neodymium really come to prominence, for use in hybrid cars and wind turbines. A direct-drive permanent-magnet generator for a top capacity wind turbine would use 4,400lb of neodymium-based permanent magnet material. In the pollution-blighted city of Baotou, most people wear face masks everywhere they go. ‘You have to wear one otherwise the dust gets into your lungs and poisons you,’ our taxi driver tells us, pulling over so we can buy white cloth masks from a roadside hawker. Posing as buyers, we visit Baotou Xijun Rare Earth Co Ltd. A large billboard in front of the factory shows an idyllic image of fields of sheep grazing in green fields with wind turbines in the background. In a smartly appointed boardroom, Vice General Manager Cheng Qing tells us proudly that his company is the fourth biggest producer of rare earth metals in China, processing 30,000 tons a year. He leads us down to a complex of primitive workshops where workers with no protective clothing except for cotton gloves and face masks ladle molten rare earth from furnaces with temperatures of 1,000°C. The result is 1.5kg bricks of neodymium, packed into blue barrels weighing 250kg each. Its price has more than doubled in the past year – it now costs around £80 per kilogram. So a 1.5kg block would be worth £120 – or more than a fortnight’s wages for the workers handling them. The waste from this highly toxic process ends up being pumped into the lake looming over Dalahai. 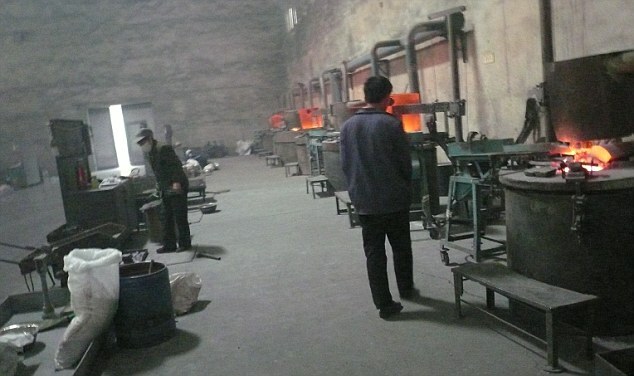 The state-owned Baogang Group, which operates most of the factories in Baotou, claims it invests tens of millions of pounds a year in environmental protection and processes the waste before it is discharged. According to Du Youlu of Baogang’s safety and environmental protection department, seven million tons of waste a year was discharged into the lake, which is already 100ft high and growing by three feet each year. Jamie Choi, an expert on toxics for Greenpeace China, says villagers living near the lake face horrendous health risks from the carcinogenic and radioactive waste. ‘There’s not one step of the rare earth mining process that is not disastrous for the environment. Ores are being extracted by pumping acid into the ground, and then they are processed using more acid and chemicals. The fact that the wind-turbine industry relies on neodymium, which even in legal factories has a catastrophic environmental impact, is an irony Ms Choi acknowledges. It’s a long way from the grim conditions in Baotou to the raw beauty of the Monadhliath mountains in Scotland. But the environmental damage wind turbines cause will be felt here, too. These hills are the latest battleground in a war being fought all over Britain – and particularly in Scotland – between wind-farm developers and those opposed to them. Cameron McNeish, a hill walker and TV presenter who lives in the Monadhliath, campaigned for almost a decade against the Dunmaglass wind farm before the Scottish government gave the go-ahead in December. Soon, 33 turbines will be erected on the hills north of the upper Findhorn valley. McNeish is passionate about this landscape: ‘It’s vast and wild and isolated,’ he says. Huge empty spaces, however, are also perfect for wind turbines and unlike the nearby Cairngorms there are no landscape designations to protect this area. When the Labour government put in place the policy framework and subsidies to boost renewable energy, the Monadhliath became a mouth-watering opportunity. People have been trying to make real money from Scottish estates like Jack Hayward’s Dunmaglass. Hayward, a Bermuda-based property developer and former chairman of Wolverhampton Wanderers, struck a deal with renewable energy company RES which, campaigners believe, will earn the estate an estimated £9 million over the next 25 years. Each of the turbines at Dunmaglass will require servicing, which means a network of new and improved roads 20 miles long being built across the hills. They also need 1,500 tons of concrete foundations to keep them upright in a strong wind, which will scar the area. Dunmaglass is just one among scores of wind farms in Scotland with planning permission. Scores more are still in the planning system. There are currently 3,153 turbines in the UK overall, with a maximum capacity of 5,203 megawatts. Around half of them are in Scotland. First Minister Alex Salmond and the Scottish government have said they want to get 80 per cent of Scotland’s electricity from renewables by 2020, which means more turbines spread across the country’s hills and moors. Many environmental pressure groups share Salmond’s view. Friends of the Earth opposes the Arctic being ruined by oil extraction, but when it comes to damaging Scotland’s wilderness with concrete and hundreds of miles of roads, they say wind energy is worth it as the impact of climate change has to be faced. ‘No way of generating energy is 100 per cent clean and problem-free,’ says Craig Bennett, director of policy and campaigns at Friends of the Earth. But Helen McDade, head of policy at the John Muir Trust, a small but feisty campaign group dedicated to protecting Scotland’s wild lands, also points out that leaving aside the damage to the landscape, nobody is really sure how much carbon is being released by the renewable energy construction boom. Peat moors lock up huge amounts of carbon, which gets released when it’s drained to put up a turbine. Environmental considerations aside, as the percentage of electricity generated by wind increases, renewable energy is coming under a lot more scrutiny now for one simple reason – money. We pay extra for wind power – around twice as much – because it can’t compete with other forms of electricity generation. Under the Renewable Obligation (RO), suppliers have to buy a percentage of their electricity from renewable generators and can hand that cost on to consumers. If they don’t, they pay a fine instead. There’s a simple beauty about RO for the government. Even though it’s defined as a tax, it doesn’t come out of pay packets but is stuck on our electricity bills. That has made funding wind farms a lot easier for the government than more cost-effective energy-efficiency measures. Already, RO adds £1.4 billion to our bills each year to provide a pot of money to pay power companies for their ‘green’ electricity. By 2020, the figure will have risen to somewhere between £5 billion and £10 billion. When he was Chancellor, Gordon Brown added another decade to these price guarantees, extending the RO scheme to 2037, guaranteeing the subsidy for more than a quarter of a century. It’s not surprising there’s been an avalanche of wind-farm applications in the Highlands. Wind speeds are stronger, land is cheaper and the government loves you. By 2020, environmental regulation will be adding 31 per cent to our bills. That’s £160 green tax out of an average annual bill of £512. As costs rise, more people will be driven into fuel poverty. When he was secretary of state at the Department of Energy and Climate Change, Ed Miliband decreed that these increases should be offset by improvements in energy efficiencies. It’s a view shared by his successor Chris Huhne, who says inflation due to RO will be effectively one per cent. Britain’s low-income families, facing hikes in petrol and food costs, will hope he’s right. Individual households aren’t the only ones shouldering the costs. Industry faces an even bigger burden. By 2020, environmental charges will add 33 per cent to industry’s energy costs. Our current obsession with wind power, according to John Constable of energy think-tank the Renewable Energy Foundation, stems from the decision of the European Union on how to tackle climate change. Instead of just setting targets for reducing emissions, the EU told governments that by 2020, 15 per cent of all the energy we use must come from renewable sources. Because of how we heat our houses and run our cars with gas and petrol, 30 per cent of electricity needs to come from renewables. And in the absence of other technologies, that means wind turbines. But there’s a structural flaw in the plan, which this winter has brutally exposed. Study a graph of electricity consumption and it appears amazingly predictable, even down to reduced demand on public holidays. The graph for wind energy output, however, is far less predictable. Take the figures for December, when we all shivered through sub-zero temperatures and wholesale electricity prices surged. Peak demand for the UK on 20 December was just over 60,000 megawatts. Maximum capacity for wind turbines throughout the UK is 5,891 megawatts, almost ten per cent of that peak demand figure. Yet on December 20, because winds were light or non-existent, wind energy contributed a paltry 140 megawatts. Despite billions of pounds in investment and subsidies, Britain’s wind-turbine fleet was producing a feeble 2.43 per cent of its own capacity – and little more than 0.2 per cent of the nation’s electricity in the coldest month since records began. The problems with the intermittency of wind energy are well known. A new network of cables linking ten countries around the North Sea is being suggested to smooth supply and take advantage of 140 gigawatts of offshore wind power. No one knows for sure how much this network will cost, although a figure of £25 billion has been mooted. The government has also realised that when wind nears its target of 30 per cent, power companies will need more back-up to fill the gap when the wind doesn’t blow. Britain’s total capacity will need to rise from 76 gigawatts up to 120 gigawatts. That overcapacity will need another £50 billion and drive down prices when the wind’s blowing. Power companies are anxious about getting a decent price. Once again, consumers will pay. Wind power’s uncertainties don’t end with intermittency. There is huge controversy about how much energy a wind farm will produce. Many developers claim their installations will achieve 30 per cent of their maximum output over the course of a year. More sober energy analysts suggest 26 per cent. But even that figure is starting to look generous. In December, the average figure was less than 21 per cent. In the year between October 2009 and September 2010, the average was 23.6 per cent, still nowhere near industry claims. Then there’s the thorny question of how many homes new installations can power. According to wind farm developers like Scottish and Southern Electricity, a house uses 3.3MWh in a year. Lobby group RenewablesUK – formerly the British Wind Energy Association – gives a figure of 4.7MWh. In the Highlands electricity usage is even higher. So, against the backdrop of environmental catastrophe in China and these less than attractive calculations, could the billions being thrown at wind farms be better spent? Undoubtedly, says John Constable. The British energy market is a hugely complicated and ever-changing landscape. We rely on a number of different sources for our energy - some more efficient than others, some more polluting than others. Here, you can see how much energy each type contributes, how much they are predicted to contribute in 2020, how much carbon dioxide they generate and how efficient they are. Renewable energy sources receive varying subsidies - which are added to our energy bills - as a result of the government's Renewables Obligation, whereas 'traditional' sources do not. Critically, government cost figures do not include subsidies, whereas our measure shows precisely how much money a power station receives for each megawatt-hour (MWh) it produces, which includes the price paid for the energy by the supplier and any applicable subsidy. This is an instant measure of an energy supply's cost-efficiency; the lower the figure, the less that energy costs to produce.